my barstool slipcovers and coffee table makeover this week! and found the perfect piece at Goodwill for $8, and now it's complete. Since they're so formal I like to pair them with either rustic or modern items. I like accessories more edited than this, but wanted to show you all the pieces. The one on the right is my newest find. the other pieces can easily be found, just not quite as plentiful. That's my simple collection of silver. a good Thanksgiving tip I forgot, and what I put in the advent boxes. Sooo pretty. You deserve a trophy for your beautiful arrangements! Love how you paired the silver with the rustic touches...so pretty! Oh good, so glad you're going to tell us what's in the boxes! Inquiring minds want to know. 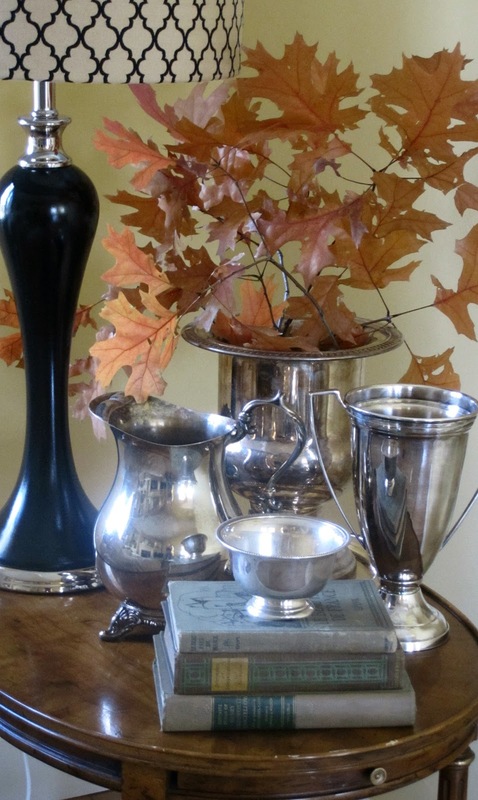 So pretty, I love a pretty pairing of classic silver and rustic leaves. I am with you on not being able to handle clutter around the house. Great inspiration! I am looking at my mantle as I type thinking it may be a good candidate for some silver..Thrift store here I come! Looking forward to your tutorials! I did see all your features this week..Congrats! Love the silver! I have a collection too and they are so easy to find at thrift shops like you said. We have similar tastes!